Editor’s Note: This is the first of a two-part series by the late Rebecca Bruns on the splendors of Ubud, the fabled mountain village in Bali. Though written over 20 years ago, the scene in Ubud is has changed very little. The Balinese believe when they die they’ll go to a place that looks just like Bali. And the town that looks the most like Bali, and feels the most Balinese, is Ubud, the island’s cultural center. Ubud, whose name derives from the Balinese word “ubad,” meaning “medicine,” attracts an artsy crowd seeking a cure for the party animal hustle at the beach resorts of Kuta, Sanur and Nusa Dua. Located less than an hour’s drive inland from the coast, Ubud is a mountain town where the nights are cooler, the restaurants close by 10:00 p.m., and the closest thing to a disco is the local temple packed with teenagers watching the festive Barong dance till dawn. One of Indonesia’s 13,000 plus islands, Bali has been a living legend since Western artists discovered back in the ’20s and ’30s and feared it would lose its soul to tourism. It still hasn’t. Ubud preserves the storybook dreamscape that everyone associates with Bali: tender green rice fields and vaporous volcanoes, barefoot people who move with a trance like grace balancing towers of fruit on their heads, temple gates reaching to heaven, the air tinkling with gamelan music and wind chimes. There’s no doubt that Ubud has become a major resort, with its dozens of economical guesthouses and shops crammed with bewitching treasures, yet its major charm is its cleaving to tradition. Ubud preserves the traditional Balinese way of life which blends religious worship with the making of art. There’s no word for “art” in Balinese, it’s just something the people do as naturally as breathing, with neither fame nor fortune as their motive. They express not themselves but their religious faith and joy. In Balinese Hinduism, the mountains are the stronghold of the gods all temples are built to face the higher elevations while the sea contains darker forces. In seaside Kuta you can cruise from Mushroom Rock to Tropical Climax to beer-guzzling Peanuts, hearing Madonna and Bruce Springsteen, while in hilly Ubud your senses tingle with gamelan music and the fresh scent of frangipani and incense wafting from endless offerings in doorways and small temples. Legong, Barong, Kechak and Ramayana light up Ubud and nearby villages. Hawkers roam the streets, selling tickets for just $1.50 to $2.50 apiece, including transportation to the dance site. This is not to mention the art galleries, museums, workshops, temple celebrations and occasional cremations that make the brain reel with exoticism and pageantry seldom seen in the West outside of Mardi Gras. I arrived in Ubud with the hope of discovering what makes Balinese culture so rich. To my surprise, the Shangri La I’d expected first appeared as a boisterous little berg on a brokendown road selling Diet Coke alongside of handwoven backpacks. The emerald terraces, waddling ducks and suspension bridge over a plunging ravine unfolded only as I was leaving town for the Amandari, Ubud’s premiere hotel. I was lucky enough to spend my first night at the Amandari, an organic pleasure palace perched above a river gorge. Art and tradition rule here, too. Designed by Australian architect Peter Muller, who worked equal wonders with the Amanpuri on Thailand’s resort island of Phuket, the hotel simulates a Balinese village with 27 walled garden suites virtual houses with sunken outdoor tubs. Tip toeing over stepping stones through a pond full of lily pads, I opened my villa’s front door. Rounded and thatched, with teak beams and rattan furniture, it had floor to ceiling screens and window walls which rolled back to let in the light and lushness of the outside. From the terrace I heard the sigh of the Ayung River far below. Magenta bougainvillea and sprays of orchids splashed the greenery with color like laughter that melted into the twilight. At daybreak, workers with flowers behind their ears were up polishing the woodwork. The glassy hillside pool trembled under the fingers of a morning breeze, giving me a taste of that hushed, spiritual beauty that sets Ubud apart. Art touches every upscale hotel in Ubud, and many budget spots, too. The chic Kupu Kupu Barong (“Big Butterfly”), not far from the Amandari, hotel’s heart stopping views from its split level rooms that teeter like cushy attic condos over the river gorge. Closer to town, the riverside Hotel Tjampuhan has a crumbling, ornate Balinese acquaintness with twisting paths to hillside rooms swallowed in banana trees and vines. At Ulun Ubud Cottages, a mossy stone stairway winds down past tiers of bungalows to a pool slung over the Campuhan River. I wore the heels off my sandals hunting for a cheaper guesthouse along the backroads of Ubud. 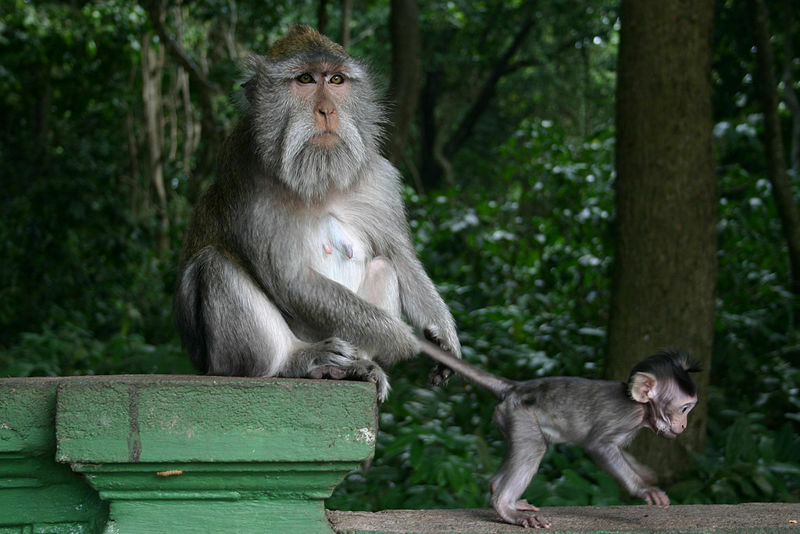 Dozens of simple inns and homestays for $10 a night and under crowd the countryside, especially along Monkey Forest Road, a dusty thoroughfare past open fields and vagabond haunts recalling the hippie heyday. I checked out the Puri Muwa guesthouse with caged titiran birds hanging on every veranda (“wonderful alarm clocks,” said the manager), the Frog Pond Inn with its bargain cubbyholes (nobody home and all the doors wide open), and the Monkey Forest Hideaway with romantic old fashioned beds and kerosene lamps instead of electricity (already booked for the week). That brought me to the edge of the forest, a cave like, rooty underworld housing the old Pura Dalem, temple of the dead. Even Ubud’s only jungle felt like a vintage illustration. I bought a temple sash and two bags of peanuts from a vendor, and stepped into the overgrown gloom. Almost instantly, several gray, fuzzy monkeys barreled up like gargoyles and snatched at the bag in my hand, racing away with stolen peanuts. One of them bit an overgenerous British tourist, and a Canadian girl murmured, “Oh dear, I hear they have syphilis” while the poor Brit cradled his hand. The potbellied grandfather monkeys, their brows knit cantankerously, lumbered up with a demanding air that made me hide my peanuts and head for the temple. A sign on its rusted gates announced in pictures that tourists could enter for temple ceremonies only in Balinese, not Western, dress. No ceremony today. The colored sash would do. Inside, monkeys swarmed everywhere. 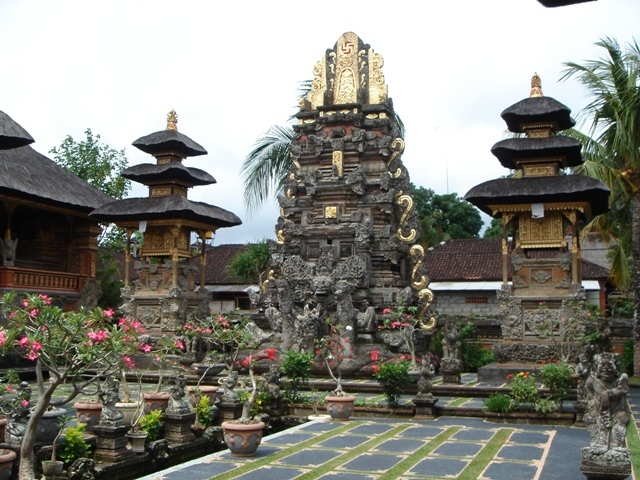 They lolled on the fanged statue of the witch Rangda, who was devouring a child; they sunbathed on the dragons and weather stained gates; they blended into the ornamentation, the baroque intricacy and animistic too muchness that typifies Bali, as though everything is seething with life and spirits. Yet the monkeys kept to themselves, obeying some unspoken rule of tranquility that made the temple a true sanctuary, both for them and the big hairless apes with cameras. Heading back toward town, I stumbled on guesthouse called the Artini II guesthouse (Artini I is across the street), a lovely walled compound as peaceful as a convent, glittering with gilded doors and blooming gardens. The rooms, lined in bamboo matting, came with baths,fans, bamboo beds and porches where breakfast (usually a toasted banana sandwich and tea) was served every morning. For $11 a night, I’d found my home in Ubud. Rebecca Bruns, was a freelancer living in San Francisco, who specialized in the tropics and exotic culture. To find out more about her visit http://www.rebeccabruns.net. Stay tuned for Part II of this series.